Since it came out a little more than a year ago, I have done thirty-three interviews on my book The First Thanksgiving: What the Real Story Tells Us about Loving God and Learning from History. No television yet (I’m still waiting for a call from Good Morning, America), but a l0t of radio and a smattering of podcasts mixed in. I’ve done everything from podcasts from a preacher’s garage to drive-time shows in major urban markets like Dallas and Denver, St. Louis and San Francisco. All of the interviews have been with Christian venues. I suppose the book’s subtitle scares everybody else away. Probably because all of my interviewers have been Christian, they have all been pretty sympathetic interviews. Although it would be bad form to ask them, I suspect that very few of my interviewers have actually read the book. There have been exceptions, but not many. At the end of the summer I had my first opportunity to do an interview for a national audience. I flew to Little Rock, Arkansas, headquarters of the Christian Ministry Family Life, started by Dennis and Barbara Rainey, and our conversation on the program Family Life Today will be aired in two segments next Monday and Tuesday, November 3-4. You can listen online on those days by going to the FamilyLife website. Alternatively, the website also can tell you which radio stations in your area carry the program. Wheaton College undergraduates attend chapel services three times a week during the academic year. Typically, the entire student body meets together in our beautiful Edman Chapel, but once each term students gather in smaller groups within their home departments–biology majors with biology majors, philosophy majors with philosophy majors, etc. Today was the appointed day for departmental chapels, and it was my privilege to be the featured speaker in the chapel service hosted by the Department of History. The title of my talk to our majors was “Thinking Historically About Vocation.” At the beginning of the year my History Department colleagues and I decided that we needed to do a better job of helping our students think about life after graduation and the range of career paths they might follow. Toward that end, we plan to bring back a number of History alums to campus for a series of panel discussions about possible vocational paths. In preparing my remarks, I relied heavily on a work that I would recommend to anyone wanting to think Christianly and historically about vocation. 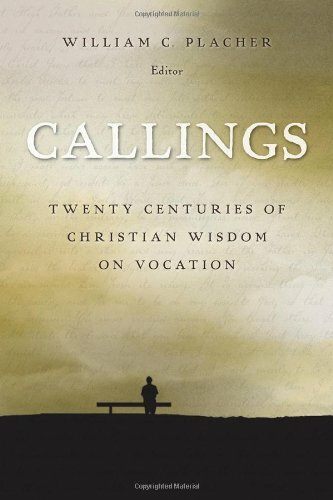 The book is Callings: Twenty Centuries of Christian Wisdom on Vocation, edited by the late William C. Placher. Placher was a long-time philosopher and theologian at Wabash College, and Callings is an an anthology of fifty-seven selections from prominent Christian thinkers of the past two millennia from the first-century bishop Ignatius of Antioch to the twentieth-century Swiss theologian Karl Barth. In her marvelous little book The Spiritual Practice of Remembering, Christian historian Margaret Bendroth observes that most modern-day Christians are “stranded in the present.” Dismissing what the Apostles’ Creed refers to as “the communion of saints”–the fellowship of believers across the ages–we cut ourselves off from the hard-won insight of believers across the centuries and rely instead on the trendy and popular musings of the moment. Callings assaults such arrogance head on. (And it is a form of arrogance, if we’re honest about it; C. S. Lewis called it “chronological snobbery.”) As we read systematically through the selections, we join a conversation that began long before we came on the scene and will continue long after we are gone. In doing so, we discover that intelligent, devout believers have differed dramatically over the centuries about a concept we tend to take for granted. Placher identifies four broad periods in history in which “calling” has had different meanings. The first was the Early Church Period, say 100-500 A.D. During these years it was far from easy to be a Christian. 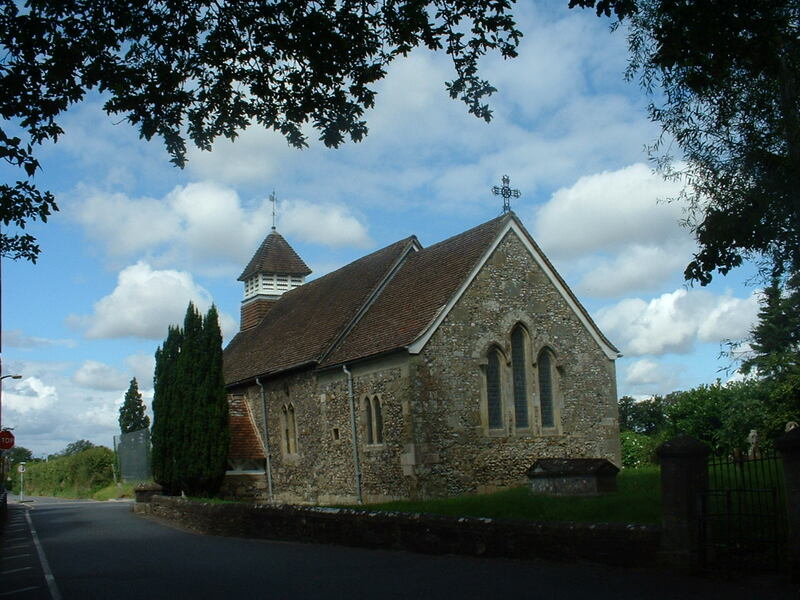 Most Christians were in the minority in their communities. It was common for followers of Jesus to come to faith as adults, and their decision to profess faith often came at great personal cost, sometimes meaning a break with family, sometimes leading to persecution. During this period, when individuals wrestled with calling, they were confronting the basic question of whether to profess faith and, if they did so, how open to be in their declaration. One of my favorites selections from this period is an excerpt from Augustine’s Confessions, written around the close of the fourth century. During the Middle Ages, 500-1500, Christian writing on calling changed significantly. In those areas around the world where Christians were to be found, they were usually in the majority in their communities. Christianity was pretty much the dominant religion wherever it existed at all. Most Christians lived under the authority of the Church and were surrounded by other believers. As a result, when Christian writers reflected on the concept of calling, they rarely had in mind the question of whether to become a Christian. They were much more preoccupied with the question, “What kind of Christian should I be?” Specifically, now the decision at the heart of finding one’s calling was whether to pursue a “religious” life. During these centuries, to have a calling meant to serve in the priesthood or a monastic order, becoming a priest, monk, or nun. Not coincidentally, individuals who wrote on calling tended to belong to monastic orders themselves, such as the Italian Dominican Thomas Aquinas or the German monk Thomas a’ Kempis. As Placher notes, it’s unlikely that either of these periods offers a perspective on calling that feels right to us. If you’re like me, when you think about calling you’re probably not thinking about whether God might be leading you to join a monastic order, as would have been the case during the Middle Ages. At the same time, you probably do have in mind something more specific than the general call to faith in Jesus as Lord, as calling was typically understood during the Early Church Period. Don’t we typically think of something between these extremes–a general sense that God is summoning us to do a certain something with our lives, and that doing that something will give our lives greater meaning, purpose, and fulfillment? This understanding of calling dates to the third period that Placher identifies, namely the four a half centuries or so during and after the Protestant Reformation, say from the early 1500s to the late 1800s. Two crucial things were happening during these years that transformed thinking about calling. First, early reformers like Martin Luther and John Calvin began to push back against the Catholic teaching that only priests, monks, and nuns were pursuing a calling from God. Any task undertaken as unto the Lord is “reckoned very precious in God’s sight,” Calvin wrote in his Institutes of the Christian Religion. Second, much of the western world was undergoing a period of increasing commercialization and economic sophistication that historians call the Market Revolution. When Calvin wrote in the 1530s, he still inhabited a world of severely limited options. He could take for granted that almost all females would labor as wives and mothers, while almost all males would inherit the occupations of their fathers. The son of a peasant farmer would be a peasant farmer; the son of a craftsman would be a craftsman. In contrast to Christian writers in earlier centuries, both Calvin and Luther tended to equate “calling” with “occupation.” Neither, however, offered advice to Christians about how to figure out the occupation to which God was calling them, because neither really expected their readers to have much choice in the matter. Their goal was to teach Christians that, whatever kind of work they had inherited as their lot, they could quite literally think of it as a calling fraught with religious significance. Over time, thanks in large part to the economic changes swirling around them, the heirs of Luther and Calvin began to modify or elaborate on their teaching. They began to distinguish between “general calling” (the calling to faith in Christ) and “particular calling,” the calling to a specific walk of life or job. More significant, they began to offer advice for discerning the latter. 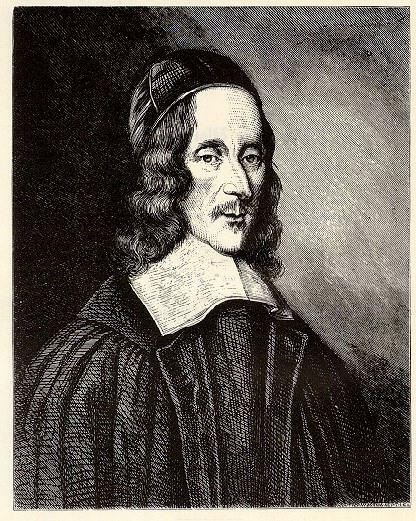 English Puritans like William Perkins (writing at the close of the sixteenth century) and Richard Baxter (writing in the latter half of the seventeenth century) pinpointed a series of criteria for identifying an appropriate “particular” calling. Any line of work we would pursue, they taught, a) must be something we can practice with integrity and conformity to Biblical principles; b) should in some way serve the common good; c) should express the desires of our heart; and d) should mesh with our particular abilities or skill set. These criteria would not point the Christian to one and only one possible line of work, but they would be helpful in narrowing down the range of acceptable particular callings. The fourth and final period that Placher identifies is what he calls the “Post-Christian” era of the late-nineteenth and twentieth centuries. In this period it has no longer been a given that Christians are in the majority in the communities where they reside. (In this sense our world resembles the Early Church Period.) During these years a number of Christian writers have consciously tried to return the focus of “calling” to the divine summons to live a life of obedience to Christ and to take the focus away from paid work. A key writer in this vein is the late Karl Barth, whose writing on the topic is one of my favorites. Barth argued that the early Reformers were right in insisting that the Catholic definition of calling during the Middle Ages was far too narrow. In seeking to redress this, however, they committed their own error by equating the concept of calling so exclusively with work. According to Barth, the divine calling applies to the totality of our existence, cutting diagonally across every dimension of our lives. The past does not always have the right answers, but its answers are often at least different from those of the present, and the differences cause us to question our own previously unexamined assumptions. . . . After traveling in other countries, we come back to our own with new questions. But the past too is a different country, and, voyaging in it, we gain richer perspectives on our own time. Thanksgiving is six weeks away, and it occurred to me that many of you may be looking for some good Thanksgiving-related reading in advance of the holiday. There are many books that you can choose from, but two in particular come immediately to my mind. 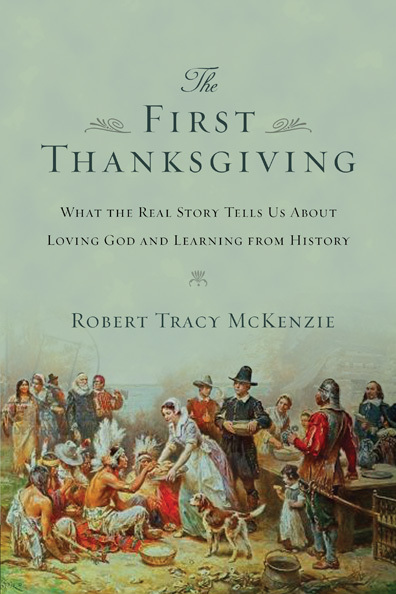 The first–if you’ll forgive me for saying so–is my book The First Thanksgiving: What the Real Story Tells Us about Loving God and Learning from History. The book came out in the fall of 2013 from Intervarsity Press, and it was a labor of love. For years I had been gradually developing a new sense of vocation. I believe that academic historians write too much for each other, leaving the public to learn about the past from pastors, talk-show hosts, rap musicians, and other public celebrities. As a Christian historian, I have come to believe that part of my calling is to be a historian for Christians outside the Academy. If you are a Christian who is interested in American history, I want to be in conversation with you about what it means to think Christianly and historically about the American past. That is why I started this blog two years ago, and that is why, about seven years ago, I began my research on the Pilgrims and the First Thanksgiving. Go over to Amazon.com, however, and you’ll find a lot more buzz about a different Thanksgiving title. 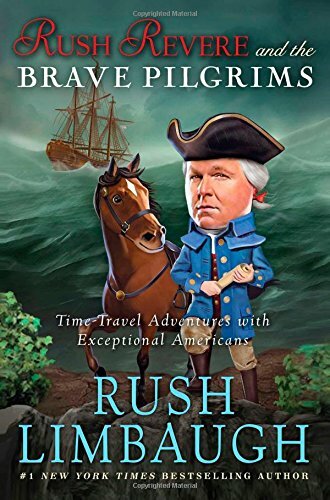 In what I can only attribute to God’s determination to keep me humble, the month after The First Thanksgiving was released, Rush Limbaugh came out with a book on the same topic: Rush Revere and the Brave Pilgrims. The book follows a middle-school history teacher named Rush Revere and his time-traveling, talking horse named Liberty. The pair go back to visit the Pilgrims in 1620 and 1621 and discover that they all would have voted Republican and opposed Obamacare. I have previously posted two extended essays on Limbaugh’s take on the Pilgrims (see here and here), so I am not going to cover that ground again. Suffice it to say that the book is pretty much a train wreck. I consider myself a political conservative, and so I take no pleasure in saying that, but the book has little redeeming value as a work of history, even for children. For Christian readers, the book should be positively offensive. In Rush’s revisionist re-telling, the First Thanksgiving had nothing to do with the Pilgrim’s gratitude to God for bringing them through a deadly winter and blessing them with a bountiful harvest. In fact, it had little religious dimension at all. 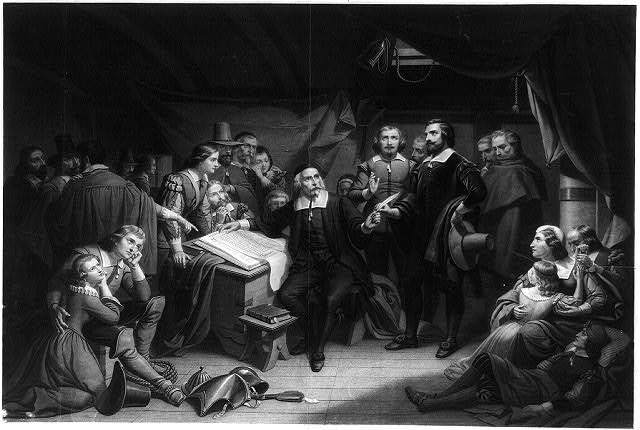 The Pilgrims and the Wampanoag were instead celebrating how God had delivered them from the futility of socialism and alerted them to the benefits of free enterprise. As a historian, I think no good cause is ever served by distorting the past, whether intentionally or accidentally. And as a Christian historian, I am grieved that the Pilgrims’ timeless example of perseverance and heavenly hope amidst unspeakable hardship has been obscured, their faith in God overshadowed by their purported faith in the free market. If you listen to Limbaugh’s radio program (I’ll confess that I do occasionally), you know that he encourages his readers to buy his books in order to counteract the lies and half-truths that supposedly mar American history as it is taught in the public schools. With regard to the Pilgrims and the First Thanksgiving, I have no doubt that the real story is rarely told. But if you’re hoping to find a more accurate re-telling from a time-traveling talking horse, prepare to be disappointed. This is where I think Civil War re-enactments can be valuable. Walking among the camps, watching soldiers joking and playing cards, listening to a lecture on Civil War medical instruments, watching a demonstration of Civil War cannon, enjoying the strains of popular nineteenth-century songs—all of these experiences can fuel our imaginations. At their best, they allow us to see the past “as through a glass, darkly.” Whatever their inaccuracies—and they are always inaccurate—we walk away with the sense that we have walked for a moment in the shoes of those who came before us. I see potential value in re-enactments right up to the point that they try to re-create battle. That’s where I want to get off. 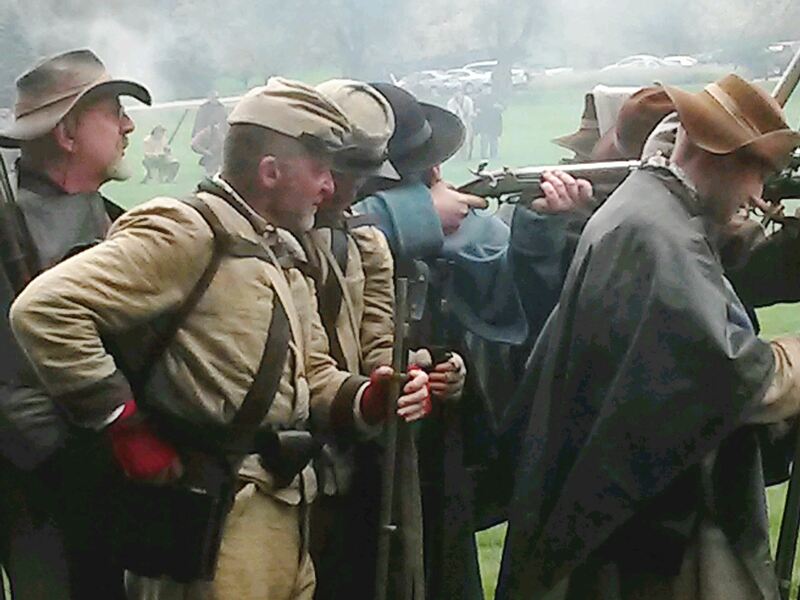 As I wrote previously, the re-enactments that I have witnessed transform war from a hellish thing into a hobby. They make battle into an entertaining spectacle, a pageant to be admired. And when they do that, they teach what isn’t true. They obscure what Americans actually learned about war between 1861 and 1865. Instead, they unwittingly re-create the naïve fascination that prompted civilians to flock to the First Battle of Bull Run for the pleasure of watching Americans kill Americans. So if I hold such a view, why in the world would I attend another re-enactment? Three reasons, I guess. The first was a desire for fairness. When I posted my previous piece on re-enactments, I was unaware that there was going to be a major re-enactment this past weekend almost literally in my own backyard–at Cantigny Park in Wheaton, only about twenty minutes from my home. Perhaps this one would be different, I thought. Curiosity was also a factor. I noticed that the schedule included a presentation by a well-known Lincoln impersonator. I was interested to see what this incarnation of our nation’s sixteenth president might have to say about the war’s causes. Finally, to be completely candid, my Tennessee Vols had just lost for the tenth year in a row to the Florida Gators, and I wanted to get out of the house and take my mind off of the humiliation. Cantigny is a 500-acre public park on the former estate of the late Robert McCormick, the long-time editor and publisher of the Chicago Tribune during the first half of the last century. McCormick’s mansion has been preserved and is open for tours, and there is also a world-class museum on site dedicated to the history of the U.S. Army’s First Infantry Division. (McCormick was an officer in the First Division during WWI.) The grounds are beautiful, open, and extensive, and they offer an ideal locale for a variety of public events, including craft fairs, concerts, and weddings. Last weekend they became home to the Union and Confederate armies. The weather on Saturday was unusually raw for early October. It was wet, windy, and cold, and the crowd looked like it was ready for a Bears game more than a historical demonstration. True to the other re-enactments that I have attended, the main event of the day was a mock battle. I took my place in the crowd, and we waited with anticipation for the entertainment to begin. In front of me was an elementary age kid—maybe nine or ten years old—wearing a blue Union forage cap at a jaunty angle and wielding a toy pistol. When half a dozen cannon opened fire to signal the beginning of the battle, the boy shouted his approval while his dad strained to record the scene on his camera phone. Looking at the faces around me and their expressions of delight, it struck me that we might have been watching a Fourth of July parade, or perhaps a group of jugglers at the county fair. I don’t think our reactions would have been any different. Soon the Confederate infantry began a determined advance on the Union position, and as the lines converged, the whistling Yankee minie balls began to find their mark. 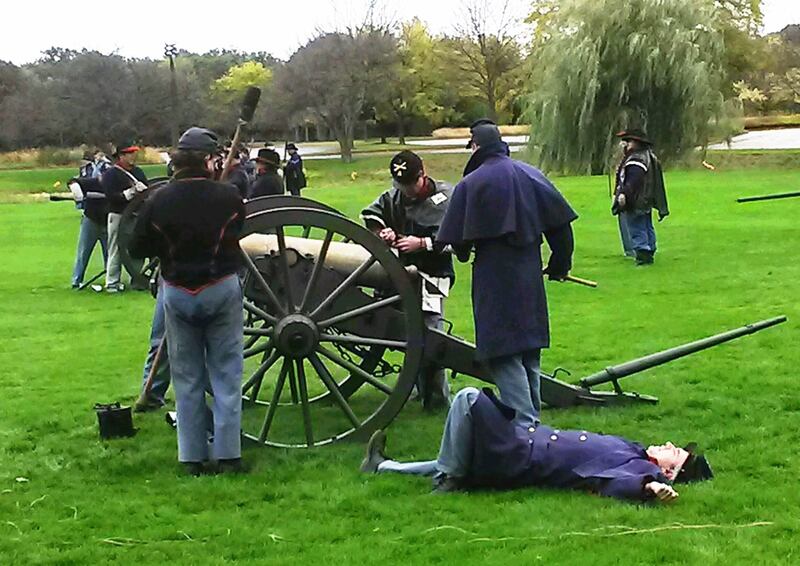 I have heard from a few re-enactors who assure me that their units never pretend to recreate a battle. I’ll take their word for it, but I’ve yet to see such restraint. In this particular demonstration, the soldiers on both sides were dropping like flies. Only a few feet from us, a Union volley tore through the charging gray line, and when the smoke had cleared there was a clump of Confederate casualties writhing in death throes as we snapped pictures furiously. When one of the mortally wounded Rebs tried to crawl away before finally collapsing, my little Union friend whipped out his toy pistol and did his best to finish him off. Similar scenes were occurring elsewhere, and soon the field was littered with corpses. At this point, the announcer thanked us for coming, we applauded, and the dead began to rise. I don’t think that final part was historically accurate. You already know what I think of this, so I won’t belabor the point. I’ll simply say that nothing I saw Saturday changed my mind about these mock battles. It’s not just that they fail completely to capture what battle was really like. That goes without saying. All efforts at historical recreation always fall short, yet they can still have value. But these efforts to recreate battle aren’t just inaccurate. They’re pernicious. They utterly obscure the horrors of war. Nothing good comes from making war an entertaining spectacle. Let me put my cards on the table. As a history teacher, there are two things that I always want my students to learn about war. The first, to quote William Tecumseh Sherman, is that “war is a hellish thing.” The second (lest you think I am a pacifist), is that war, though unspeakably horrific, is sometimes necessary and just. As a culture, if we stress only the first truth without also teaching the last, we leave ourselves spiritually and psychologically unprepared to wage war should war be thrust upon us. But if we stress only the latter, without also teaching the former, we may be training the rising generation to take war lightly. Perhaps the deepest divide in our country today runs between those for whom war is a relentless threat and those for whom it’s an occasional television show. At our most prestigious colleges, the former is now the most underrepresented minority group. In other words, should the U.S. have to send troops into combat in some distant part of the world, proportionately few of my students will ever be directly affected. War to them is a comfortably remote abstraction. I think that’s dangerous. But as much as I want my students to confront war’s horrific dimension, it is equally important that they wrestle with the question of when war might be justified. There is a long tradition in Christian teaching—coming down from St. Augustine through Thomas Aquinas—that war between nations can be morally defensible. “Just war” doctrine says that, in a fallen world, one fallen nation may use deadly force against another as a last resort to promote long-term peace and avert grave injustice. How this applies to the American Civil War is a difficult, difficult question that I’m not remotely ready to answer. But there is one implication of just war theory that is undeniable: war is not intrinsically just. This means that if we want to judge the morality of any particular war–say, the Civil War, for example–we need to think long and hard about the circumstances that led to it. It is both artificial—and I think harmful—to study any war without also studying its causes. This leads me to my other chief concern about Civil War re-enactments. The ones that I have attended make almost no effort to address the reasons why these men are supposedly shooting one another. We are evidently supposed to admire them for their courage without reference to the cause for which they were fighting. But courage, like war, is not intrinsically noble. Courage, according to Webster’s, is “the ability to do something that you know is difficult or dangerous.” Strictly speaking, bank robbers may have courage. Murderers and terrorists may have courage. Courage is a means to an end, not an end in itself, and it is noble only to the degree that the end we seek is morally just. In other cases, it’s a tragic waste. And so I went with interest following the battle to listen to “Abraham Lincoln” share with us about the Civil War. Maybe a tenth of those who had watched the battle did the same. We were actually treated to a conversation with both Mr. and Mrs. Lincoln, played by nationally known impersonators Michael Krebs and Debra Ann Miller. Krebs’ performance was really quite good; in his appearance and delivery, he was more impressive than any Lincoln impersonator I have ever seen. But I listened carefully to what their presentation might say about the causes of the war and there just wasn’t very much. The Lincolns engaged in playful banter, Abraham cracking jokes and Mary alternately scolding her husband and and laughing with him. 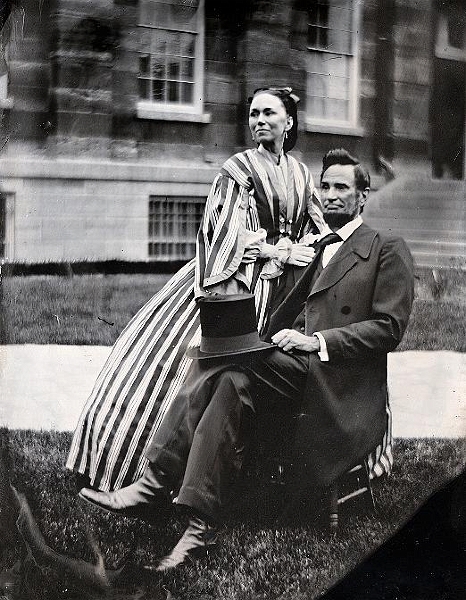 There were references to President Lincoln’s supposed first love, Ann Rutledge, who died before Lincoln could declare his affection, as well as tearful allusions to the wartime death of their son Willie. But apart from a brief reference to soldiers who died “on the altar of freedom,” there was almost nothing that might be construed as trying to explain what the war was about. I understand why Civil War re-enactments don’t try to offer a definitive answer to the question, “What caused the Civil War?” The re-enactors may very well disagree among themselves, and the audience may also be divided (if not indifferent). Fair enough. And yet when we teach about war as if it can be understood apart from its causes, we cross a dangerous line. It may seem simply good manners to praise both sides as equally courageous and honorable. If we’re not very careful, however, we will also be presenting the two sides as morally equivalent–and that honors neither side. Fall has arrived in the Midwest. The leaves are beginning to show orange and red, the temperature is supposed to dip into the thirties tonight, and my recent trip to southern California already seems like a dream. I spent the latter half of last week in Malibu, where an organization called the Conference on Faith and History convened for its 2014 biennial meeting. The Conference on Faith and History is a national organization of Christian historians that has been in existence for nearly half a century. About three hundred participants gathered for this year’s meeting. The program was amazing, the fellowship was great, and I had a blast. Almost everyone I tell about the location of the meeting chuckles and winks. The assumption is that the CFH intentionally seeks out beach-front locales for its meetings, as if we were all looking for a place where we could put on Speedos and sip drinks with little umbrellas in them. Nothing could be further from the truth. In past years, I’ve attended CFH gatherings in such non-Malibu-like sites as Huntington, Indiana, Shawnee, Oklahoma, and Holland, Michigan. The CFH always holds its national meetings on Christian college campuses, and it just so happened that this year’s host school was Pepperdine University. Not that I’m complaining. 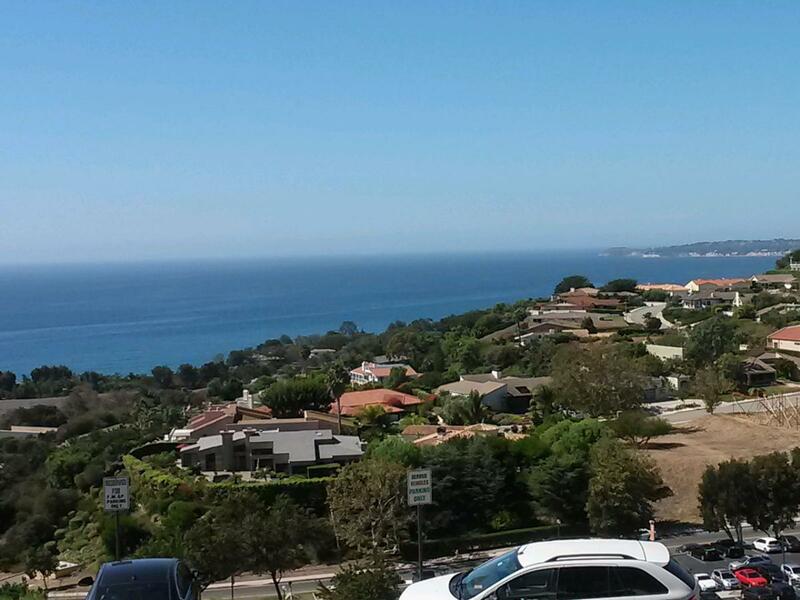 Have you ever been to Pepperdine? It is perched on high ground overlooking the Pacific Ocean, and the vistas from the heart of campus are just ridiculously gorgeous. How anyone gets any work done there I can’t imagine. In an odd way, it was comforting to come back to the Chicagoland area, knowing that I could look forward to weather that will drive everyone indoors for the next eight months. What a blessing. . . . But enough about the weather. My time at the conference sent my thoughts repeatedly to an extended passage in my commonplace book from Dietrich Bonhoeffer. I’ve shared a portion of it before in a different post, but I thought I would return to it now and explain why I find it so meaningful. To do so requires a bit of personal context. I hope you’ll bear with me. Thirty-two years (thirty-two years!) have passed since I embarked on an academic career. When I began graduate school at Vanderbilt University in the autumn of 1982, I thought that God might be calling me to become a Christian professor on a public university campus. I had not reached that conclusion easily. Throughout my senior year at the University of Tennessee I wrestled with several career options. With no certain sense of direction, I tried to keep my options open and did everything I could to put off making a decision. By December I had applied to thirteen different graduate or professional schools encompassing four different kinds of study. The options on the table were law, business, law and business, and history. I didn’t have peace about any of them. From hindsight, that began to change when I was home over Christmas break, thanks to an unexpected visit from a near stranger. I recognized the white-haired man on our front porch as an usher in the fairly large Southern Baptist church that I had grown up in. I didn’t know him by name, however, and I doubt that we had ever more than smiled at one another in passing. I had given my testimony in a Sunday night service right after Christmas, and this gentleman explained that he had felt impressed to pass along a book to me that someone had given him. The book that he placed in my hands was a book on Christian discipleship: The Upstream Christian in a Downstream World, by Charles W. Dunn. I took the book back to school with me that winter and read it against the backdrop of my ongoing struggle to figure out what in the world God wanted me to do with my life. Although it contained a great deal of wisdom, what struck me most was not the author’s counsel but rather his own life story. Charles Dunn was a professor of political science at Clemson University, and he filled his book with summaries of countless conversations over the years with college students about the claims of Christ. Gradually, I became more and more excited about the possibility of imitating Dunn’s example, and when Vanderbilt offered me the opportunity to pursue graduate study in history entirely on their dime, I decided to enroll and pursue a Ph.D.
Graduate school was harder than anything I had ever attempted, but it was also marvelously rewarding, and almost from the first I felt a sense of affirmation about the path that I had chosen. That sense of confidence was reinforced when, six years later, I was offered a marvelous job at a world-class research university immediately upon finishing my graduate study. My wife and I moved to the Pacific Northwest, determined to invest in the lives of students at the University of Washington. I arrived at UW confident that God had called me to be a Christian history professor, but with only the slightest idea of what that meant. I took for granted that what would make me a Christian history professor would be what I did outside of the classroom. I would look for ways to witness to unbelieving students when they visited my office, and my wife and I would lead a Bible study for college students at our church. But when I was in the classroom, what I taught and how I taught wouldn’t differ that much from my unbelieving colleagues. I would just be nicer. Had you asked me during those years, I would have insisted that I was doing my best to love God with my mind. I was pretty sure that I was imitating the apostle Paul in “pressing toward the goal for the prize of the upward call of God in Christ Jesus” (Phil. 3:14). But I was not thinking “Christianly” about my profession, nor did I have the remotest idea of what it might mean to “take every thought captive to the obedience of Christ” (II Corinthians 10:5). My evangelical upbringing had taught me that, whatever my specific career path, all that truly mattered was personal integrity and evangelism. And so for years—it embarrasses me now to admit this—I defined faithfulness in my calling with little reference to the actual content of my teaching and scholarship. Yes, I would teach a Sunday School class, and yes, I would look for opportunities to witness, but otherwise I would simply jump on the academic treadmill. By not thinking deeply about the institution in which I labored, I found it relatively easy to be content in that labor. But while I was focused narrowly on personal piety and evangelism—good things both—I was also happily serving a university which rested on a worldview that was the antithesis of what I professed to believe. I’m not pretending for a moment that I have it all figured out now, but I do think that God helped me over time to think more deeply about the foundations of the secular multiversity of which I was a part. I slowly began to realize that the classroom is never a neutral space, and that I had been teaching in a way that made me unwittingly complicit in the university’s secularizing mission. Whatever I might be doing or saying outside of the classroom, inside of the classroom I was implicitly teaching my students to make sense of their world without reference to the Author of all wisdom and knowledge. As I came to grips with this insight, I was forced to wrestle with my calling in a way that I never had before. And as I tried—really for the first time—to think “Christianly” about my vocation, I began to experience what the late Harry Blamires (one of C.S. Lewis’s last students) called “the loneliness of the thinking Christian.” Before this, I had never really felt alone as a Christian in the secular Academy for one simple reason: I wasn’t thinking like one. But now that was changing, and the result was a growing sense of alienation. This is where the Conference on Faith and History came in. I knew that I didn’t understand how to pursue my vocation as a Christian historian faithfully, but I also didn’t know what to do differently. I needed to learn from those who shared my vocation and were farther down the road than I was. Some of this I could gain by reading books and articles on the subject, but that was not enough. Looking back, I think I was sort of like the Ethiopian court official that we read about in the New Testament (Acts 8:26-40), the one who Phillip the Apostle encountered on the road from Jerusalem to Gaza. Like him, I needed a living, side-by-side conversation, and when I attended my first CFH convention I found that. The fellowship that I encountered in the Conference on Faith and History encouraged me deeply. Even more important was the ongoing conversation about calling that I was invited to join. It continues to bless me immeasurably, and I will always be grateful. And so it is that throughout last week’s conference my mind kept returning to passages in my commonplace book from Dietrich Bonhoeffer. Bonhoeffer, as you probably know, was a German theologian and pastor who was an open critic of Nazi rule from the moment that Adolph Hitler rose to power. Because the established Protestant churches were under the control of the Gestapo, for several years Bonhoeffer secretly trained young pastors in an underground seminary. In 1938 he penned Life Together, an extended meditation on Christian community that grew out of this experience. I first read Life Together the fall that I arrived at Wheaton College after twenty-two years at the University of Washington. It impressed me deeply. Bonhoeffer began by quoting Psalm 133:1. “Behold, how good and how pleasant it is for brethren to dwell together in unity!” The rest of the book proclaims two truths: First, as Christians we desperately need the blessing of Christian community. Second, we must never, ever take it for granted when we are blessed to experience it. God has willed that we should seek and find His living Word in the witness of a brother, in the mouth of man. Therefore, the Christian needs another Christian who speaks God’s Word to him. He needs him again and again when he becomes uncertain and discouraged, for by himself he cannot help himself without belying the truth. Here I read Bonhoeffer articulating both the longing I had felt at UW and the blessing that I had felt in my interaction with the Conference on Faith and History. I’ve been wrestling with the concept of vocation for nearly twenty years, and there’s only one thing I’m absolutely certain of: we need to work out our understandings of our calling in community. We need to be in conversation with other believers about what it means to follow God faithfully in the particular circumstances in which He has placed us. Bonhoeffer also writes movingly about the preciousness of Christian community. The book’s third sentence sounds the theme: “It is not simply to be taken for granted that the Christian has the privilege of living among other Christians.” Surely he must have reflected on that truth countless times in the years to come, including the two years that he spent in a succession of prisons before his execution in April 1945. It is true, of course, that what is an unspeakable gift of God for the lonely individual is easily disregarded and trodden under foot by those who have the gift every day. It is easily forgotten that the fellowship of Christian brethren is a gift of grace, a gift of the Kingdom of God that any day may be taken from us, that the time that still separates us from utter loneliness may be brief indeed. Therefore, let him who until now has had the privilege of living a common Christian life with other Christians praise God’s grace from the bottom of his heart. Let him thank God on his knees and declare: It is grace, nothing but grace, that we are allowed to live in community with Christian brethren.